The Himalayas, a dream for mountaineers and adventurers, but less known for its great comfort to serve as holiday country for families and people that want to explore and experience the unique Hinduism culture and breathtaking nature. Himalayan Leaders as a professional travel agency in Nepal offers now a wide variety of theme, family, and eco-itineraries into the spectacular Himalayas. Experience Nepal in a way that no other tour operator offers, go to unspoiled mountain villages where no tourists have been before, learn the culture from the inside by a homestay on a farm in Mainapokhari, and take a cooking class in Bhaktapur. You will visit and even participate in a development project for deaf children and teach them how to write in simple English. The warm friendliness of Nepal is also addressed by tasting the culture with music and dance. But you’ll be most amazed at the magical sunrise in the Himalayas as we invite you for a spectacular walk and overnight at a Sherpa hotel in Sarangkot. And not to forget you will be bathing Elephants at Chitwan National Park and stay within this unique resort in your own special lodge. You see all the highlights of Nepal in a complete and unique journey altogether. For all ages and memorable of its kind. This morning we will leave early for our drive to Pokhara (200km). Its is although a scenic route that offers greeneries, rivers, villages, farms and beautiful mountain sceneries. Halfway we will stop at Makanama where Nepal’s only cable car takes us to the Shrine of Manakamana with its pagoda style roofs. This temple is located on a prominent ridge (1302 MT. above sea level) overlooking the river valleys of Trisuli (south) and Marsyangdi (west). The unique location of the place is dramatized during the ride with the cable car with pectacular views include deep valleys, terraced fields and the Manaslu-Himalchuli and Annapurna ranges. In the afternoon, we reach Pokhara, the second largest city. You can wander during the evening hours in the colorful streets alongside the lake and have a dinner in one of the many restaurants along the lake. Pokhara is famous for its magnificent views of Dhaulagiri, Manaslu, Machhapuchhare, the five peaks of Annapurna and other mountain range. It is the starting point for all the adventurous trekkings. Pokhara is also called the city of lakes and has numerous beautiful lakes and mysterious caves. We will explore the most accessible and beautiful of it, Fewa Lake during the afternoon -also by taking a boat. Pokhara is also particularly interesting because of the many underground caves and wild waterfalls within walking distance located to the south. Explore, relax and dine again in the evening overlooking this breathtaking views of Lake Fewa. At the end of the night we’re already climbing up to the view point for the magic sunrise that is spectacular and can not to be missed! The Himalaya at its best will unfold its beauty to you. During our walk down, we stop for a good breakfast in one of the small and typically Nepalese restaurants. After we begin the short trek (2/3h) which brings us along the rice terraces and dense forests all the way down to Pokhara! The local farmers and their children are always interested in a little chat. At the end of the afternoon we reach our hotel for one last night in Pokhara. After breakfast drive takes us to real highlight of this unique trip: Chitwan National Park in the subtropical inner Tarai lowlands. You will sleep in the middle of nature in a jungle cottage. But first we will do a (safe) 3 hours Trisuli River Rafting Tour with our own Lost Paddle Adventure Company that not only offers a very thrilling river rafting but also an included camping lunch at the river bank. The Rivers followed from a famous pilgrimage place Gosaikunda which lies high in the Himalaya. No prior experienced needed to participate in this adventure. After the raft we will continue our drive to Chitwan. Upon arrival refreshment will be served, and a briefing followed by a sunset tour with a jeep to view crocodiles in the Rapti River. We will spend all our day in this unique place in the mids of jungle activities like a jungle drive, safari on an elephant back and a jungle walk. Dinner in the evening and cultural introduction to the Tharu, which is the largest and oldest ethnic group of the Terai region, living in villages near dense jungles in regions that were isolated over the millennia, allowing them to develop a unique culture. In the morning we will start with a jungle walk and have our lunch at the cottage. In the afternoon we will be rafting on the Karnali (this kind of rafting is on shallow water with no rapids is meant to not disturb the nature and to view dolphins and seek possibilities to watch tigers). After dinner stories there will be a presentation on cultural belief and mythologies of this exciting area. After breakfast you will go for bird watching and village exploration. After lunch the guide will drop you at the gate of the park where your driver will take you back to the border of the park for your drive back to Kathmanu. After visit you can visit the city Core that has most of the remarkable cultural wealth that evolved during the reign of the Malla (Nepal) kings between 15th and 18th centuries. The city is filled with sculptures, pagodas, stupas and palace buildings of exceptional beauty. In the evening we will invite you to an all traditional Nepali evening with music, dinner and…you will be invited to learn some of our classic dances which embodies many stories of love. 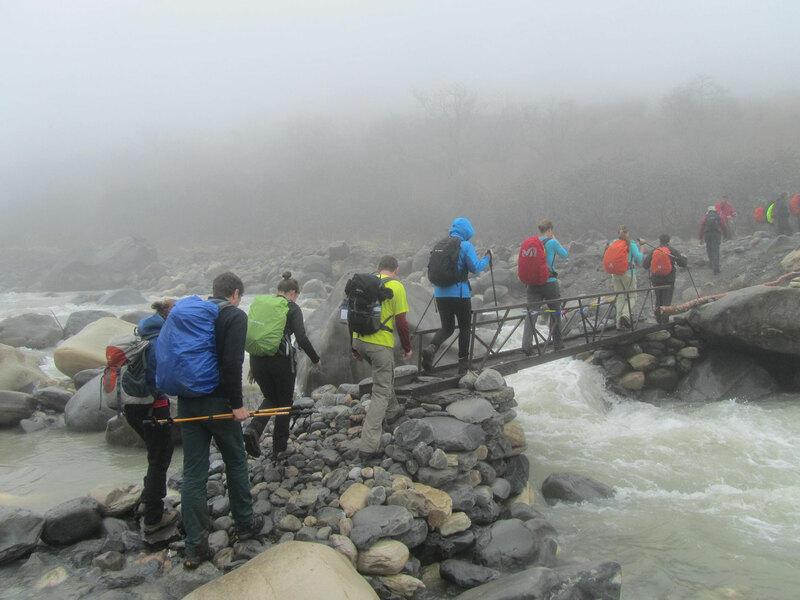 After breakfast, we drive along the Bhotekosi river towards the Araniko highway to the Tibetan border, then uphill passing through different landscapes including stunning views of Ganesh Himal. We enter Charikot, is the headquarter of the Dholkha District from where we can have closer views of Gauri Shankar, the se-cond highest peak of the Rolwaling Himal, behind Melungtse (7,181m). The name comes from Sanskrit for the Goddess and her Consort, denoting the sacred regard to which is afforded it by the peoples of Tibet and Nepal, where we will have lunch then drive downhill to Tamakosi River and uphill to Mainapokhari crossing through the village of Namdu, where we can have a great time with local family surrounding and enjoy the typical Nepali meals with local chicken. Morning after breakfast, little hiking around the area where you have nice views of Gaurishankar Himal including other many mountain peak, different landscapes, and a unique, preserved Nepali way of life on traditional farms. We then explore the construction site of a community health post built with help of Himalayan Leaders’ own NGO foundation. After lunch we drive back in 2 hrs. to Charikot. With the Sun Kosi River as its border to the west, and the Khimti Khola River running along the east, the beautiful riverine valleys of Charikot open out into majestic folded volcanic mountains and spectacular scenery. Charikot is home to a number of ethnic groups, with religious beliefs, traditions and practices being quite varied. The town of Charikot is located at an altitude of 1.970 meters and inhabits also nice restaurants and tourist accommodations. After breakfast we will drive back in just a few hours to Nepal’s capital o/n camp B/L/D and have lunch in Dulikhel which is known for one of Nepal’s most enchanting views on the Himalaya. Dhulikhel is a stage of immense beauty and a paradise for nature lovers and we will explore the ancient parts of this exceptional city. After breakfast we will drive to the near town of Banepa where the Kavre school for the deaf is situated that is established with the help of foreign NGO’s. Deaf children have here the possibility to get good education and they live as a community. You will be part of English class where the children learn English with sign language but must also foster their written skills and they gladly invite you to teach them in class this day! The lunch today will be made….by yourself in a cooking lesson where you will learn to make two of Nepal’s finest dishes: momo’s and pakoda’s. After breakfast we will visit famous sightseeing of Bhaktapur and Patan -the medire view principalities of Kathmandu valley. You will visit old royal palaces, temples, stupas, and monasteries and will see lots of striking intricate wood and stone works. In the late afternoon we return to your hotel in Kathmandu. After breakfast we will transfer you to the international airport. I did a trek (3 days) around Pokhara with Hem Loppa, my guide. I found them while going around Kathmandu, with little knowledge of the place. A guided tour seemed the best/easiest option to get to know Nepal. Hem was a great guide, adjusting to my pace, arranging additional food and willing to go around to shop for tourist items. The trek itself was beautiful, a variety of valleys and lookout-points. Definitely recommendable, yet it was one that required a being in good physical condition.